I once wrote about developing the skills to accurately plane parts to proper dimension. I have recently been making some changes to my planing technique to accommodate the capabilities and lack of capabilities of my body. Some physical issues make it challenging to do as much planing as I have done in the past. I thought I might have to get a thickness planer and jointer to do some of the work I enjoy doing by hand. 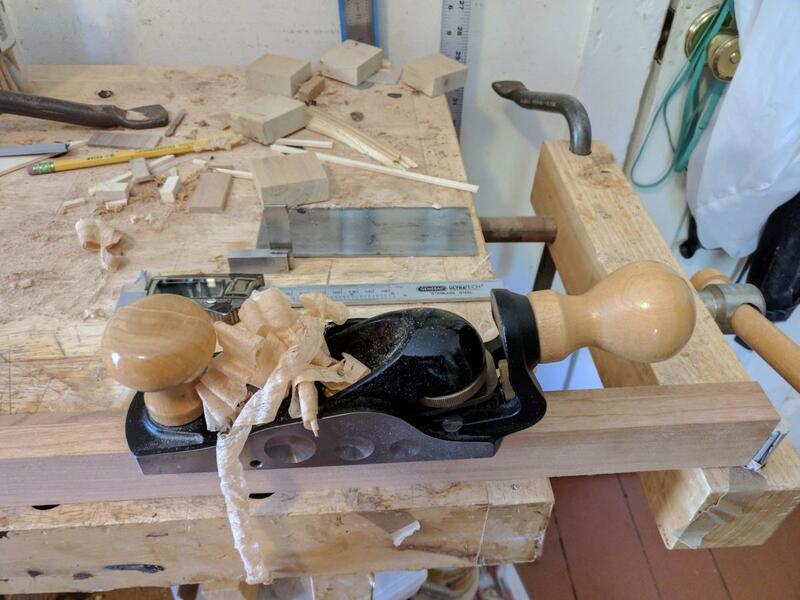 After further thought I chose to reconsider my approach to using hand planes. Until recently I got rid of lumps and bumps, hills and valley, Satan’s minions, and anything else in the way of a smooth, square, flat surface by using a jointer plane early in the process. Using that wonderful, big, long, and heavy plane repeatedly does not make some of my body parts happy anymore so now I take out the lumps and bumps, hills and valley, Satan’s minions, and anything else in the way of a smooth, square, flat surface by relying more on smaller planes and then finish up with the jointer plane. Either approach has long been in use by woodworkers and luthiers but the latter works better for me now. 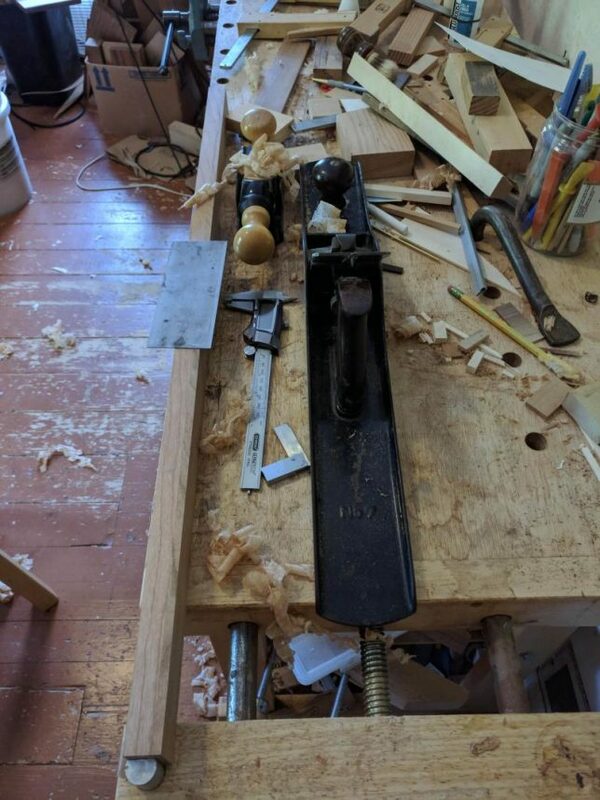 I also recently acquired a skewed low-angle block plane with a fence that makes getting the sides of the fingerboard assembly square to fingerboard much easier. 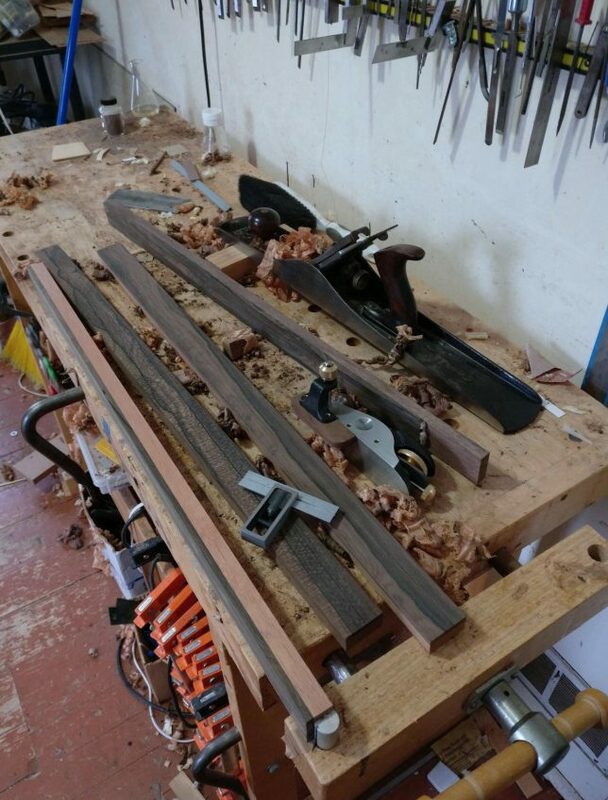 I used to leave my fingerboards a little wide so I could true them with the jointer plane and have enough wood to remove in order to get the surface both straight and square; this usually involved some trial and error and the extra wood provided a margin for error. Now I mill my fingerboards a little narrower and after getting the sides straight with the jointer plane the skewed low-angle block plane with a fence lets me square the surface using light, delicate cuts. All is well in the tiny, happy part of the world that is my workshop. In the photograph above is a small heard of small planes. I really do use all of them though not at the same time. There’s also some small spokeshaves keeping them company. 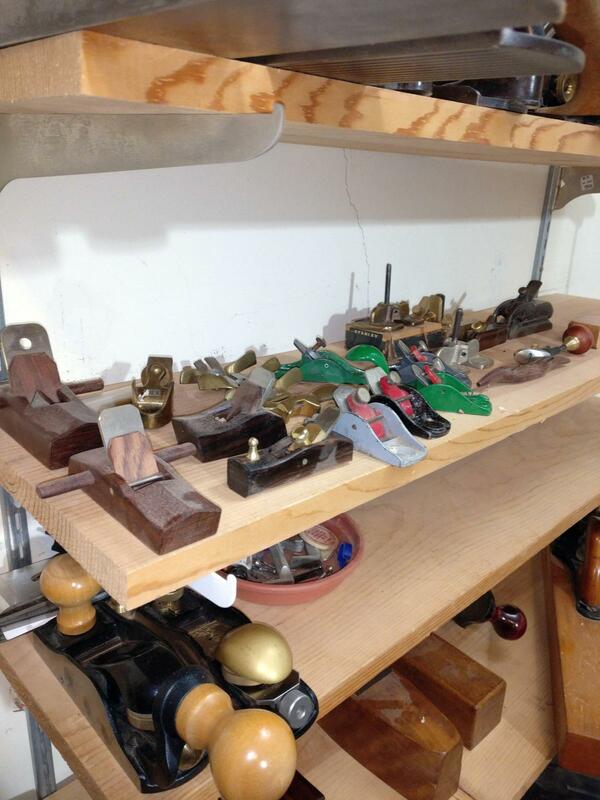 After shipping a dulcimer this afternoon I got the urge to do some deep reorganization in the workshop. This is never a good idea. 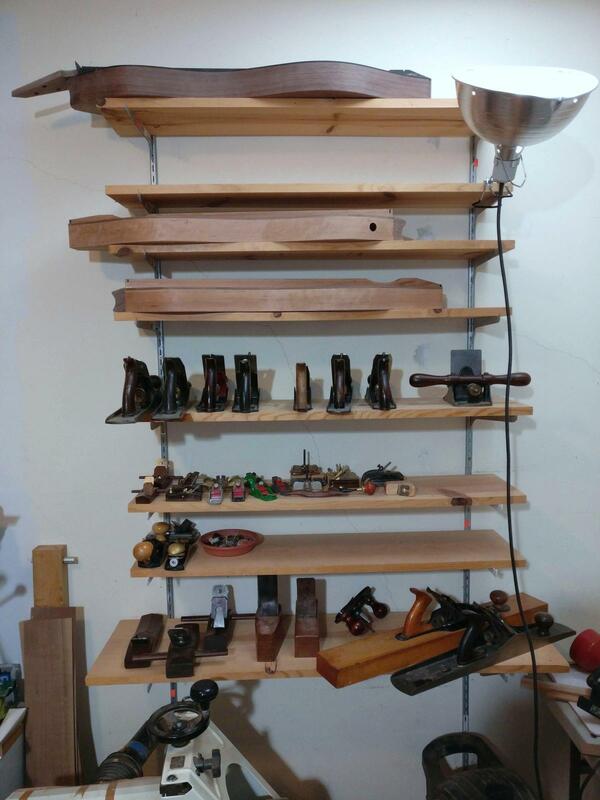 I did some less destructive cleaning and reorganization in the shop several days ago and now I can’t find a few things. My shop may look chaotic but it is my chaos and I understand how it works! Organization does have certain advantages but an organically grown chaos can have its own hidden sense of pattern and structure. While cleaning and reorganizing these shelves I decided to put the planes I rarely use in storage. There is empty space on the shelves now. This has never happened before. I’m sure it won’t be there for long. When posting picture of planes on a shelf someone will usually comment that I am storing them blade down. Many believe you should never store a plane blade down because the blade will become dull or get nicked. These shelves are soft pine that has become wavy and warped. I don’t worry about the soft pine touching the blades and on the larger planes the warp in the shelves often keeps the blades from touching the shelves. I strop my plane blades and chisels often so one way or the other they rarely become dull. Yes, my life is this fascinating. When I hand plane dulcimer fretboards the challenge is to end up with a long, relatively narrow piece of wood of correct dimensions with all surfaces square and parallel. Occasionally a fretboard ends up out of square, or too narrow, or asymmetrical, or I take off one too many shavings and open a portal releasing the hounds of hell. When this happens I console myself with the knowledge that I have hand-made a very expensive piece of firewood. In the past I tried various methods to make the process of accurately planing fretboards easier. I put fences on some planes so that, in theory, the plane would leave a surface 90° to the edge referenced by the fence. In practice I found this less accurate than planing freehand. I made a very long shooting board thinking this would make my life easier but alas, it did not. There is a plane made for fine tuning the edge of a board to get it square that was originally made by Stanley, the #95 block plane; a low angle block plane with a built-in fence. 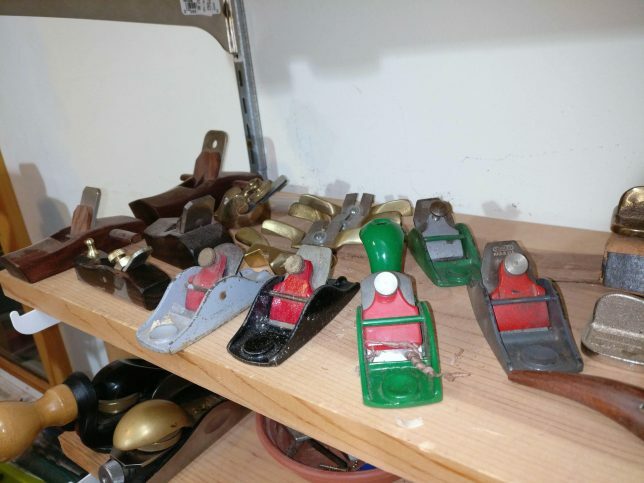 A while back I asked the hive-mind of a Facebook hand tools group if they were happy with their results when using a #95 block plane. As often happens, the reports of happiness and disappointment were equal. Gary Roberts commented that I should “develop ninja planing skills.” This was excellent advice and was what I was developing all along. Like any skill, it does get easier over time. Gary is a great guy who is generous with his knowledge of tools, trades, and crafts. Gary reissues rare, out of print books and I recommend you check out his website, Toolemera Press. In the above photograph are the tools I most often use to dimension fretboards. The long jointer plane (a Stanley #7) does most of the heavy lifting. The small machinist’s square is used to check small, square machinists. Only kidding. I use it to check for squareness as I go. The caliper lets me know how close I am getting to final dimensions and checks that surfaces are parallel. I make the last passes with the low angle block plane to fine tune angles and dimensions. The card scraper takes care of any small irregularities left by the planes. There are machines that would make this go very quickly but they take up space I don’t have, cost money I don’t want to spend, and make a lot of noise and mess. I am not opposed to machines and I do have a bandsaw, small table saw, and a few other electric helpers but I love the process and results I get by hand planing. I also get to “touch” every surface of every piece of wood that goes into my dulcimers and that makes me happy.